Hunting season is so close that your hunting dog can probably smell it! While you may want to just hop in some gear and get out there with your favorite dog, there are a few things you should take care of first. Your dog’s health should always be your number one priority, and the best way to keep your dog safe is through prevention! A preseason wellness examination will establish your dog’s health and physical condition. This way, you can know if your dog is at risk for heat stress, injuries, or infections before embarking on your hunting trip. If your dog isn’t in good shape or good health, wait to bring them out with you! Dogs that are conditioned to hunt are less likely to get injured while doing so! Training your dog will ensure that their joints, muscles, and lungs are in good shape so they are less likely to get hurt while hunting. Try to keep excess weight off of your dog to ease their burden while hunting. Additionally, take them on some trial runs before bringing them out for a long, full day. 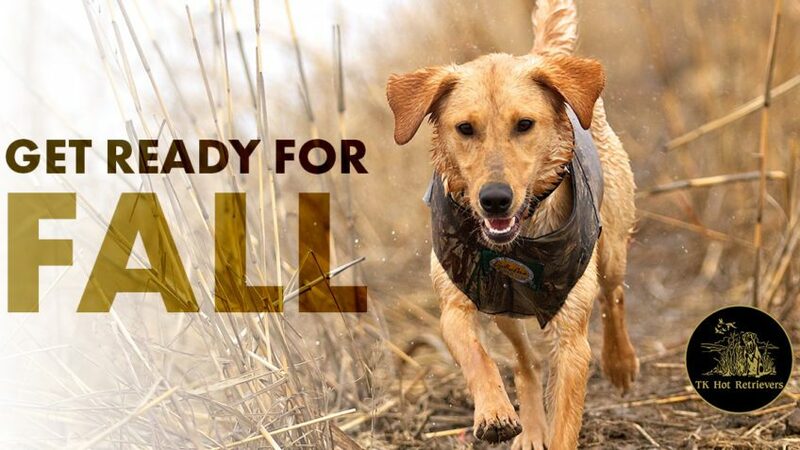 At the beginning of the hunting season, your dog will not be as accustomed to the excitement of a full day of hunting, so take it easy on them! Always carry a first-aid kit to treat your dog’s injuries. If you’re not sure what this should contain, the Humane Society has a great list of items to have in a pet first-aid kit. At the end of every hunt, make sure you restock any items that you used to ensure that you’re always prepared. Most injuries can be taken care of in the field, but if something more serious were to happen, it’s important that you have contact information for the nearest pet hospital. Hunting entails lots of traveling, hard work, and long hours outdoors, which can be tough on your dog’s immune system. Bring a supply of probiotic supplements to restore your dog’s intestinal health back to normal. Start your dog on the supplements before hunting to boost their immunity. If problems arise while on your trip, you can always sneak some more on their food! Whether a first-time hunter or seasoned pro, it is important to make sure you and your dog are prepared for hunting season, and these tips are a great start. Enjoy the season!